My husband and I enjoy getting appetizers occasionally at some of our favorite restaurants. 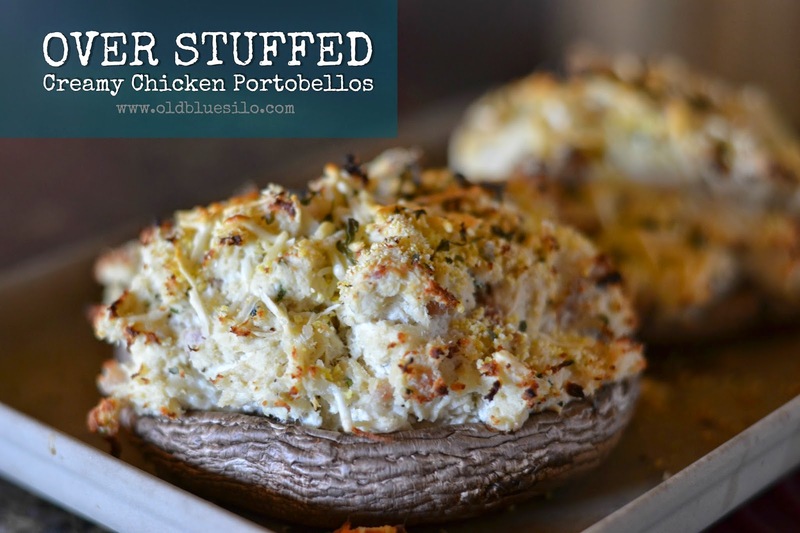 Stuffed mushrooms seem to be something that catches our attention as both of us really enjoy mushrooms. I thought to myself, why should we only enjoy stuffed mushrooms away from home? They can't be too hard to make. 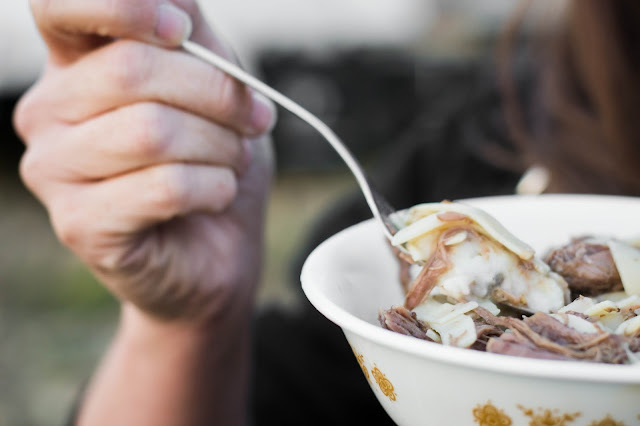 Even though my version isn't quite like one of our favorite appetizers, it's pretty close. These are really easy and you can serve these as a side or main dish. I choose them as a main dish and I'll serve them with something green. I like to keep my dishes pretty simple. The filling is mostly cream cheese, chicken and some spices but I am sure you can add veggies and other spices of your choice! If you don't like mushrooms, you can use the basic filling mixture for dips, load it on top of bread or smear it over a pizza crust! These guys are super easy to make! First you'll start by pre-baking your mushroom caps for 20 minutes at 450 degrees. Then you'll mix your filling ingredients together (see recipe below). Once the mushrooms have finished pre-baking, you'll stuff them to the brim and beyond with the filling. I don't know what it is about some automobile drivers and farm equipment but I see far too much road rage paired with the two. As farms spread out, farm equipment gets larger and highways are constructed through more farm ground, there's going to be an increased amount of tractors and trucks hauling implements. These implements are getting bigger but the roads aren't getting any wider. It's so important for farmers and motorists to work together and share the road. Spring planting and fall harvest seasons bring a huge increase in farm traffic in not only our area but many areas across the country. 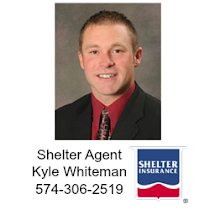 Farm safety starts with you as an individual. Whether you are in the tractor, out of the tractor or in an automobile, it's important to stay alert and be aware with whats' going on in every unique situation. Yes, it's very easy to get upset when you're behind moving farm equipment. 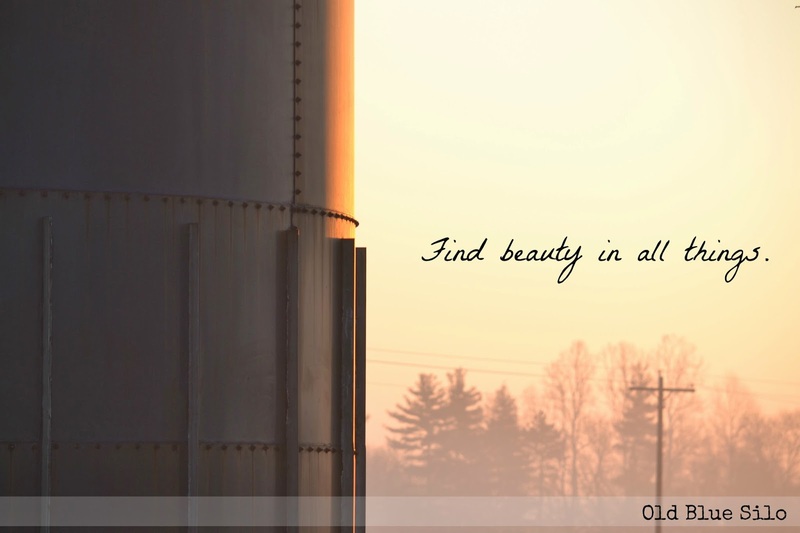 It's no different than being stopped at traffic light or finding yourself in a city traffic jam at rush hour. It's a part of life whether we like it or not. I created a graphic last fall that went sort of viral. It was in regards to road safety during harvest season. I didn't intend for people to share it, as road rage is just a personal issue/pet peeve of mine. Apparently, this is a large, growing issue that upsets many people. It was brought to my attention that we needed an updated, spring version. Craig Morgan's song International Harvestor inspired me. I know he was trying to bring good humor to the country music world but his song also raises awareness. 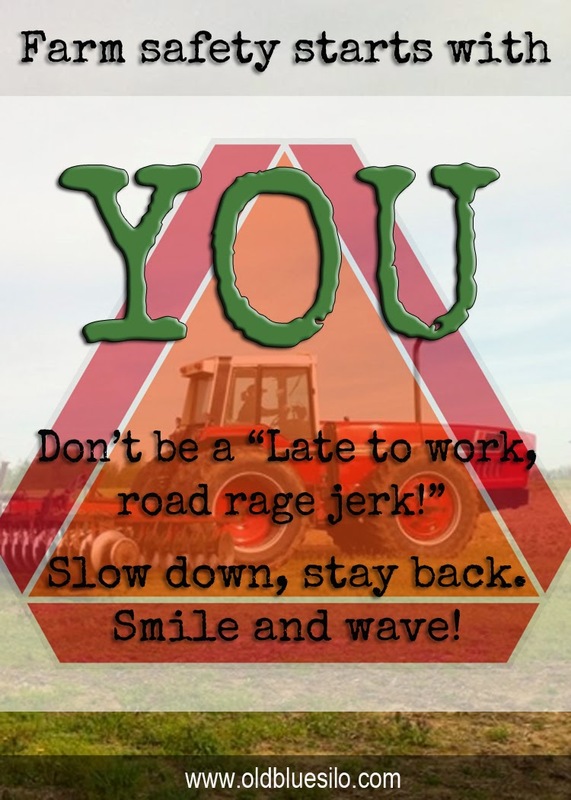 Road rage and farm equipment are not a good mix. Once again, last night as I was hauling our seed tender home in the truck, I was approached by a car that flew around me at full speed nearly throwing himself in the ditch. It was hard for me to get over since I had power lines a mail box and a fence working against me and the auger. I felt bad, but what else am I to do? I didn't see him appraching. If that car would have waited just a few more minutes, I would have turned right and been safely out of his way. It's not always the person in the motor vehicle's fault, either. It's up to farmers to keep all safety features of the tractor up to date and working along with taking in their surroundings before pulling out onto a road. Last but not least, smile and wave! 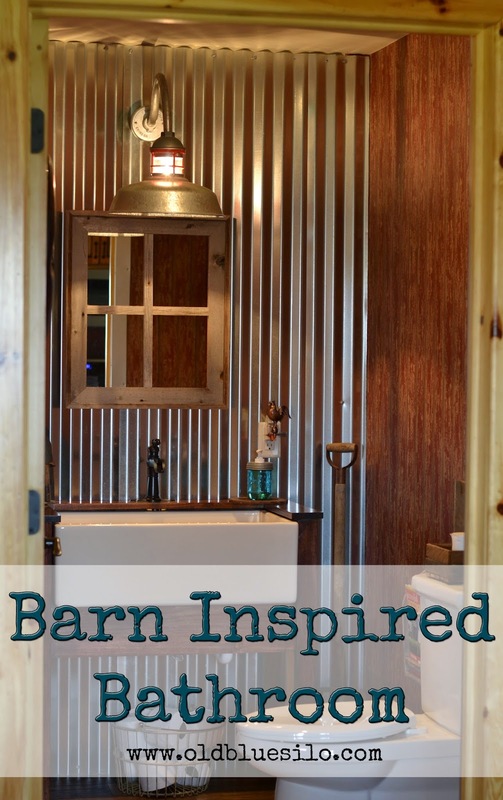 Last summer, I sent a picture to Barn Light Electric of my barn-themed bathroom, thanking them for such a wonderful product that adds the charisma I needed to complete my bathroom. They contacted me shortly after to do a feature on their blog. You can read it here. Afterwards, Betty, Barn Light's blogger suggested I work on my little blog and see where it takes me. At the time, I didn't really have any readers and my posts were semi-cheesy. (Well, maybe they still are, ha!) To be honest with you, that whole situation is really what inspired me to grow Old Blue Silo. I never would have thought that it would grow to what it is today. I've laughed, cried and put my heart and soul into this blog, sharing my passions, goals and dreams with you all. The doors and [windows] this blog and bathroom have opened have been truly amazing. Recently, I realized, I have never shared my barn-themed bathroom in a post. There's a picture of it on our Barnhouse link but I didn't go into much detail. I waited for a nice, crisp sunny day and took some pictures. The past few years, mason jars have become quite popular in home decor! I'm starting to notice a new trend as mason jars are being sent outside to play on the patio and in landscapes. I decided to look up some ideas to possible incorporate my love for mason jars into my outdoor life. Here's what I found! This set is so cool! There is a solar panel built into the handle of the carrier. Each jar can be removed and used as a light to guide your way. Jars charge at the base. I think this set would be fun for cook outs and camping! We're always scrambling around for a flash light. This would solve that problem! How cute would this be hanging on a shepherd's hook or from your tree? Cute and functional as you can also feed the birds with it as well. While you're out feeding your birds, you can feed the hummingbirds too! My mom's favorite bird. My worse enemy. They tend to dart at me because they're attracted to my read hair. Bzzzzzzzzzzzzzzzzzzzzzzzz. Love the mercury glass!These would be fun to set on a table or hang from a shepherd's hook! They already have the hardware for hanging and the solar light lid built in. You could line your walkway or light up your picnic table. Already have the jars? These lids will help you create your own solar light look! I've seen many brands and finishes available. 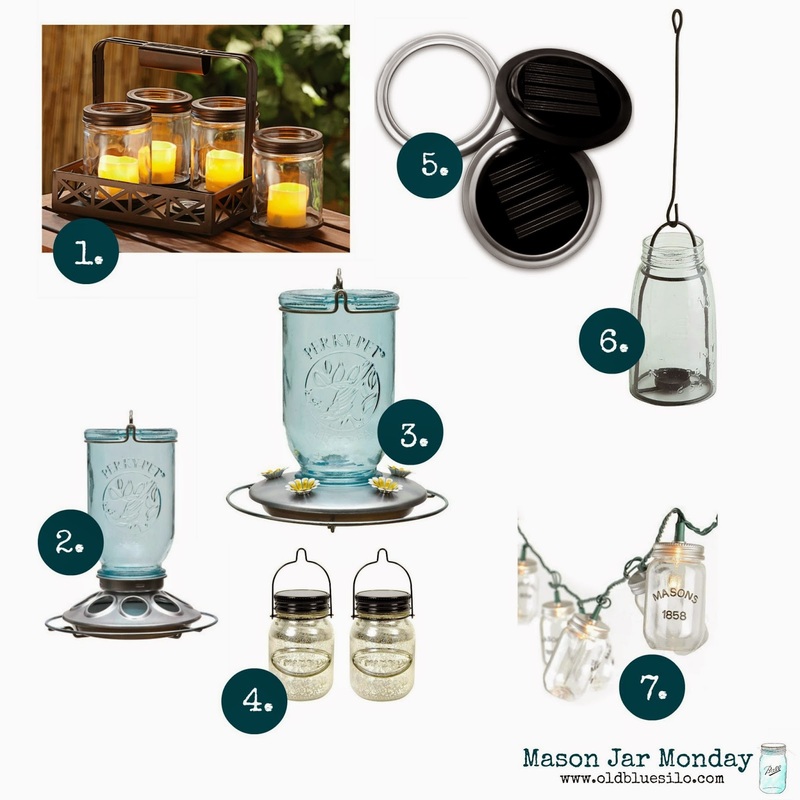 Create a fun ambiance with these mason jar tea light holders! You could use an LED tea light or maybe the real thing! I saved the best for last! These are irresistible. I am not quite sure what I would do with them! Maybe string them around my patio door for a deck party........ then bring them inside at Christmas to string on my tree? Who knows but they look fun! Do you decorate with mason jars outside? I'd love to hear your ideas! Once you have figured out what you want to write about, it's really good to have at least one image incorporated into your blog post. Some of us are visual readers and often, we aren't drawn into an article until we see a graphic or photograph that draws appeals to us. I hate it say it though, a lot of us judge books by the cover so it's important how to incorporate good images, graphics or photography into your blog posts. 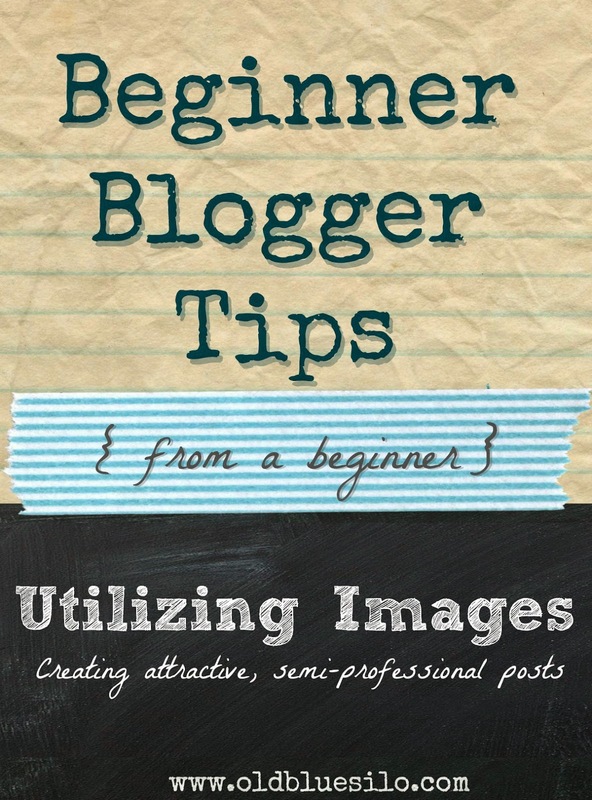 When I first started blogging, I was intimidated by every one's images and graphics. I thought for sure in order to be a good blogger, you had a be a professional photographer! I later found out that that is so not the case. Yes, it helps to have an amazing camera but you can do some pretty awesome things with just your iPhone camera! As I mentioned earlier, I found out it's not a matter of taking professional pictures. It's a matter of presenting your images and graphics in the right, relevant way. I have put together some basic tips to keep in mind when creating and sharing images in your blog posts. Keep in mind, I am not a photographer and I have a lot to learn when it comes to photography, taking pictures and operating a camera. I have learned these few tips and tricks to make my images better along the way! One morning this past week, I was folding a load of laundry from the dryer. I folded a few of my husband's jeans and a couple of t-shirts. I went to grab another piece of clothing and noticed a pair of jeans I wore the previous day. I stopped and smiled because these jeans had miles. I owned them before I met my husband which was a good 6 years ago. I hadn't worn them for a while, in efforts to keep the miles off them. During their prime years, these were the jeans I always wore even over a new pair. They were just, you know, the pair. You can say I got my money's worth with these. We all have been through a lot of jeans. Some of you may even have many of the same pair but these jeans were my absolute life time favorite. The way they fit. The wash. The length. Everything about them was perfection. I tried finding another pair as these began to fade after a good several hundred (plus) washes but of course when you find something you really like, you're more than likely never going to find it again. That's why my mom always says to buy two or more of a good thing. Where am I going with this and why do you care about these old, faded over-worn jeans of mine? I recently joined a Facebook group sponsored by a blogger called 40 bags in 40 days. The gist was to fill a trash bag everyday of items to donate resulting in less clutter and you post your progress daily. Well, eventually I realized this group wasn't for me because I'd be lucky to fill one trash bag as we don't have a lot of clutter here after last summer's rampaging purge. And I am not giving up my antiques. I stuck the group out a few more days because I thought well, maybe I could learn from this so I never let my house get to the point of needing to toss 40 bags worth of stuff. I am pretty good about throwing things out. Ask my mother. She always went through my donation bags growing up to make sure I wasn't giving anything "good" away. Which is odd, because my father and brother happen to be the opposite. So, I decided to throw a wrench in the system and ask the ladies in this group their advice on what someone my age, recently married should save over the years. I don't want to have any regrets since I can be the purge queen at times. I can't remember what some of the other comments were, but one of them really stuck out in my mind when I took this pair of jeans out of the dryer. A gal had mentioned saving a pair of jeans from when she was first married. I had thought that was entirely too clever. Why? 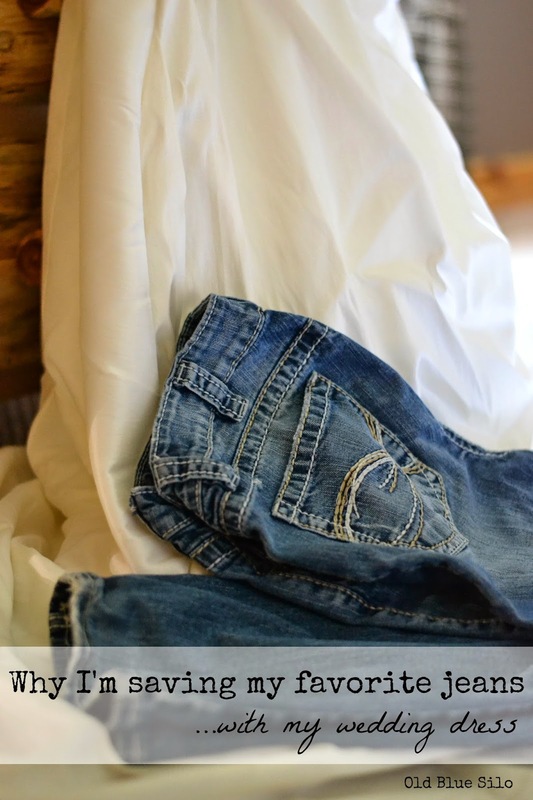 In my opinion, your jeans have more stories than your wedding dress. Your wedding dress is basically a costume that you feel obligated to wear on your big day. At least it was to me anyways. I guess you can blame that on my tom boy roots. I remember the moment my husband ask me to marry him and dreading the thought of having to wear a wedding dress. Don't get me wrong. I love my wedding dress and I am going to keep it. I made the executive decision and officially retired my most favorite pair of worn out jeans. I placed them in the canvas box with my dress. 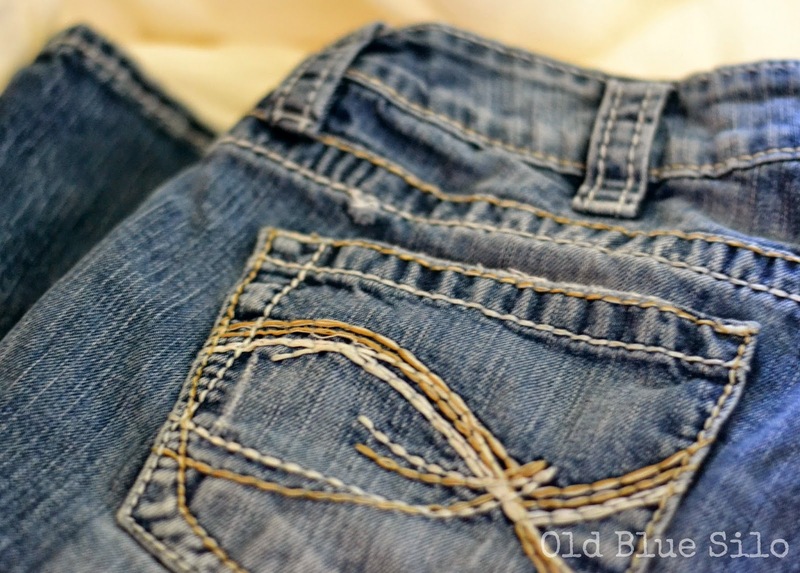 Normally, retired jeans get turned into work jeans to wear on the farm or doing work in the yard. Before I retired these jeans and had my little boxing ceremony, I showed them to my husband and said, "Do you remember these jeans?" He smiled and said, "Oh yeah..... you use to wear those ALL THE TIME." I chuckled because I remember wearing these on our second date which consisted of grilling out steak and riding the four wheeler. Eventually after about date #10, I was asked if I owned anything besides those jeans and Purdue t-shirts by my now husband. I mean, we were farm kids! Of course I always wore jeans and a tshirt on our dates... most likely we were on the fourwheeler, going to a tractor pull or a bon fire. It wasn't my fault we didn't engage in activities that required a cocktail dress and heels! So I guess since these jeans have been with us during our dating years, came with us on our honeymoon, were worn during many house building projects, helped out with harvests 2011-2013 and got me through my first few years of marriage, I think it would be fun to save them. If there is an item in my closet that describes me the most, it's these jeans. These jeans have been with me through most of my 20s. As my 20s come to a close next year, I think a lot about how much I've grown and what I've accomplished in the last decade [in those jeans]. Someday, 20, 30 years from now, when I take my wedding dress out to look at it, I may wonder why the heck a pair of jeans are in there. Or maybe I will take one look and smile. And hope that they still fit as I remember some of the best years of my life. 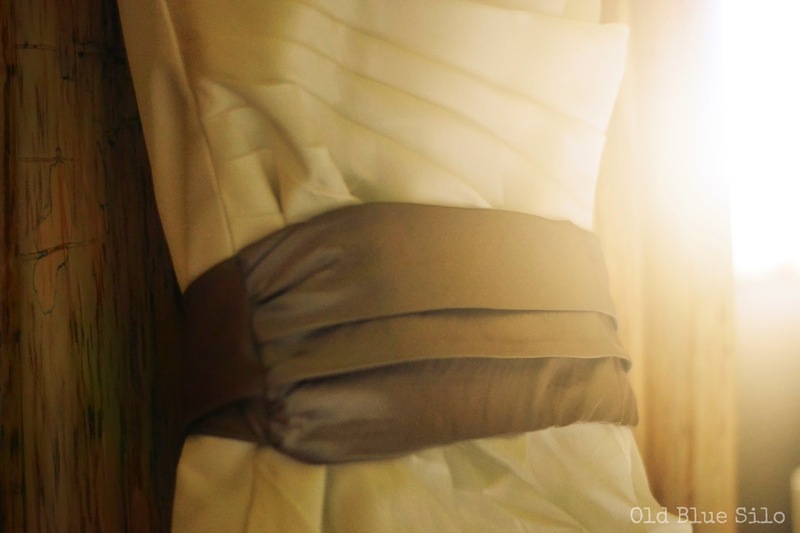 What, besides your wedding dress have you saved in a special place that defines who you are or holds some very special memories? I use to be quite the fair-weathered person. When it comes to the weather, nature and my surroundings. The older I get, however, the more I seem to find beauty in my surroundings regardless of a situation. There are times I feel guilty from when I use to complain about the old farmhouse where we started and all the trouble it put my husband through during his bachelors years. I've gotten to the point where I think about the fun memories there in the beginning of our life together. I was looking up my beginning posts on my blog last night and there's just so much pep and excitement in them. They're nerdy, but I can feel how happy I was through my writing, despite all the stress we were going through at the time as newlyweds during harvest season and building a home. I tend to associate the old farmhouse with those earlier posts. I remember writing those posts in the back of my husband's great grandparent's old bedroom from my computer in the old farmhouse. I remember being surrounded by bookshelves full of all my husband's childhood belongings, lime green carpet and a breeze coming in through the single paneled windows. That old farmhouse is now a ghost. And it's a memory that haunts our property daily. It's a good haunt, though. We've change so much about this old farm but the way it use to be is still clear as day in my mind. I wouldn't change a thing about what we did. Some of it had to go. But, I am glad the memories are still clear as day. 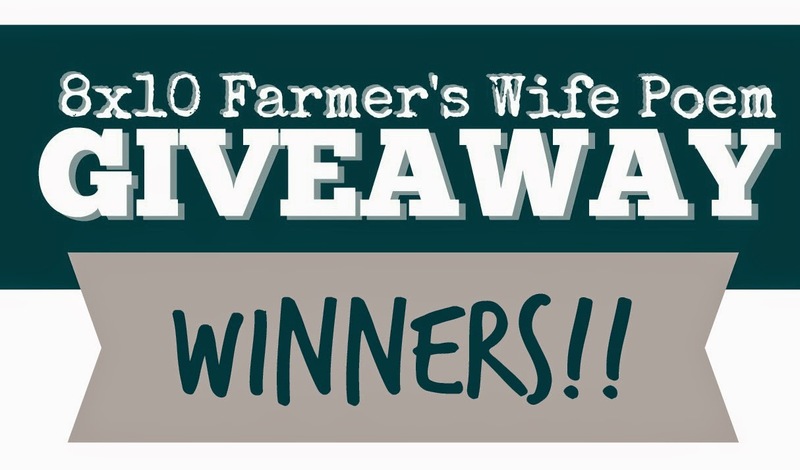 Thank you all who participated in the Farmer's Wife Poem giveaway sponsored by Sierra Shea. We had an amazing turn out and you all make me want to have more giveaways in the future. We had two lucky winners for this giveaway. Jane Zentz and Stacy Walker please come on doooooowwwwwwwn! 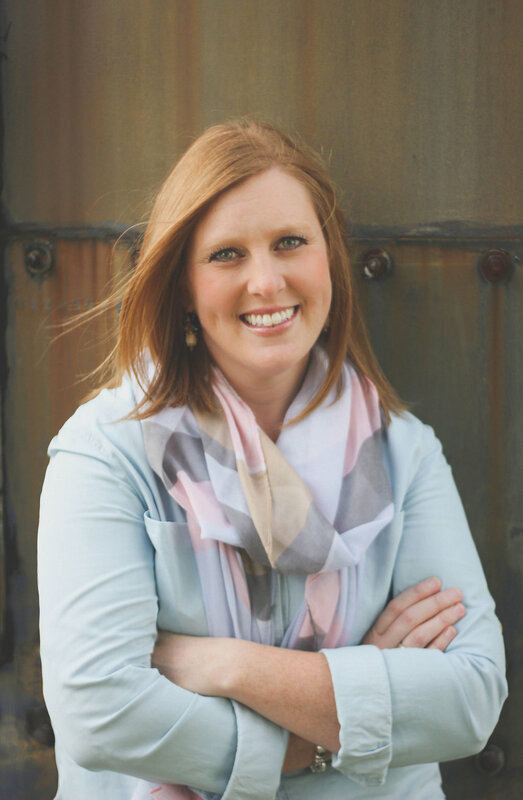 Stacy, a fellow Hoosier, is the blogger behind The Backroad Life. She and her husband run a produce farm and have three kids. Stacy runs an Etsy Shop called Sew.Stitch.Create where she sells her crochet and sewing work along with photography props. Answering the question of where she would display her poem if she won, Stacy replied, "I would most likely display it in my craft room, it is my "me" room and where I spend a lot of free time." Jane, also a fellow Hoosier (I promise, this contest was not bias towards Hoosiers!) is known around her home town for being the pie master! Jane grew up on a farm and also married a farmer. Jane has three grownup children and several grand kids in sports. This summer, she will be giving away her youngest's hand in marriage. She's a busy lady! Jane will not be keeping the poem for herself but will be gifting the poem to her mom on Mother's Day. 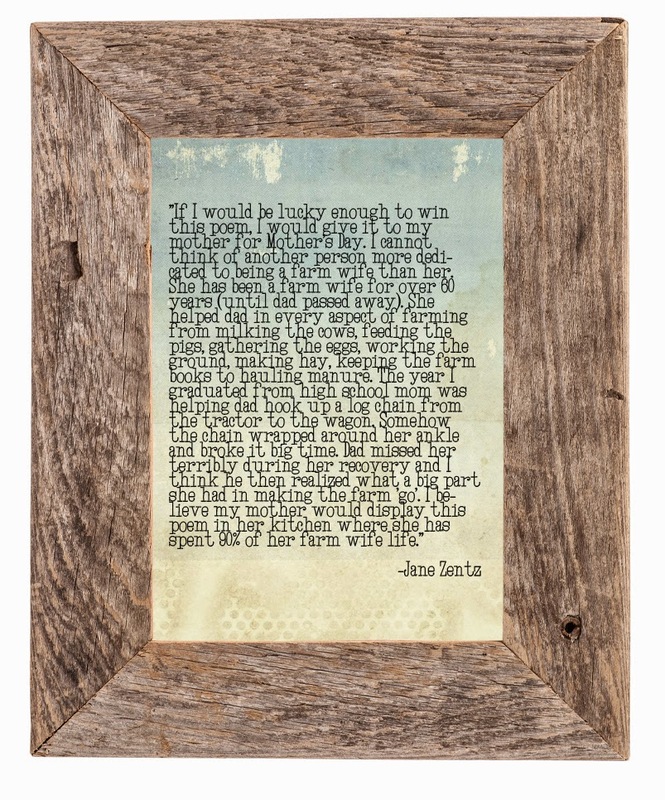 The comment Jane left upon entering the contest was so beautiful, I had to frame it. Literally! What a wonderful dedication to her mother. This was such a fun giveaway! Your comments and emails were all terrific. I looked forward to checking my email this week. Thanks again everyone and I can't wait for the next! I feel like there are a lot of "blank canvases" around our pole barn house as I search for the perfect item or idea to fill the void. I really struggled with the space in our shop next to the entryway into the house. 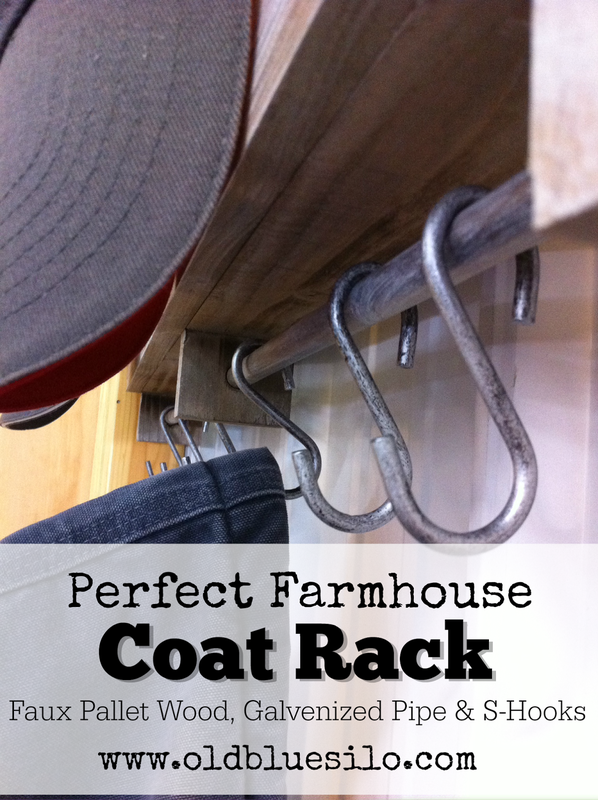 I wanted something to hang a chore coat or two on so we didn't have to open the door and grab one from the basement stairway every time (where we store farm outerwear.) We don't really have a decorating theme in the shop, but I try to keep the pieces farm or industrial related. You know, galvanized metal, tools, farm equipment memorabilia, etc. Okay, so maybe we do have a decorating theme in the shop. I shall call it... Industrial Chic. Just don't tell my husband that. He won't let me decorate the shop anymore if he knows I'm trying to make it Industrial Chic. Come on, farm shops can be stylin' and chic too. Anyways, so, back to this coat rack. I'm always trying to search outside the box when it comes to furniture, pieces and hardware. One evening I ran into Target for a bridal shower gift. You know, one of those in and out trips that end up being two hours long because it's well, Target. Guess what, guys! Today I have the opportunity to host my first giveaway on the blog! 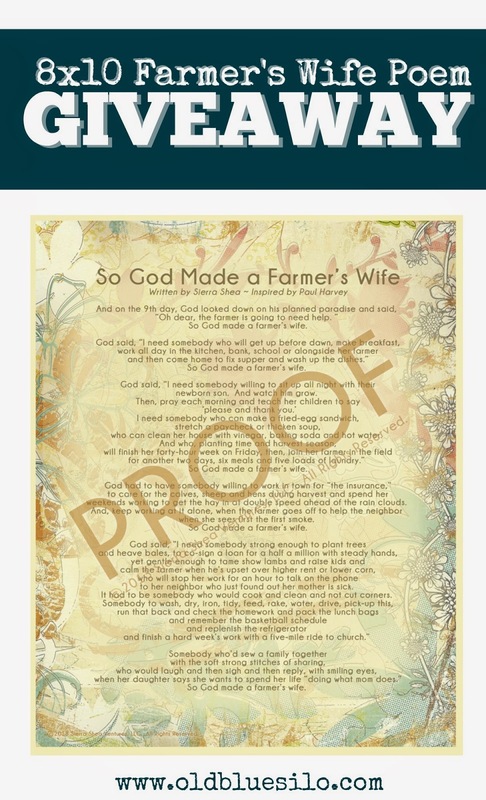 I am pairing up with Sierra Shea and we are giving away two copies of her poem, So God Made a Farmer's Wife. 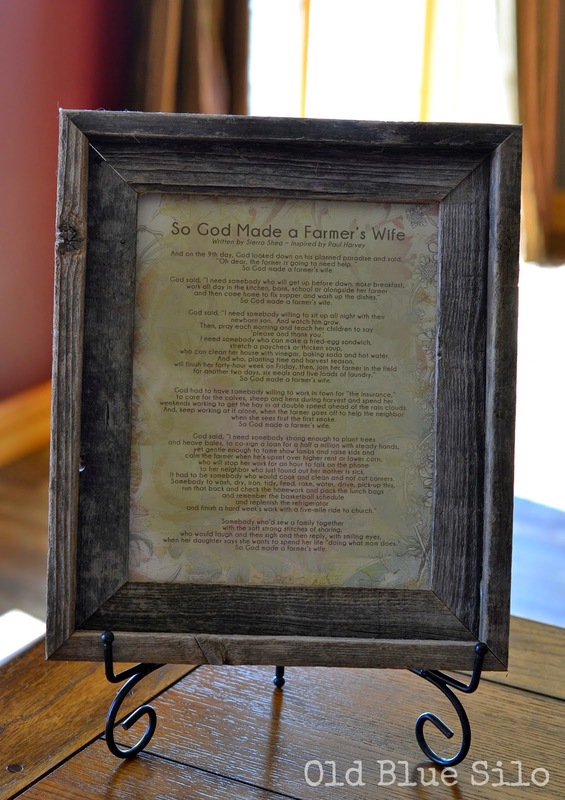 This poem is printed on high quality stock and looks beautiful in an 8x10 frame. Sierra Shea sells this poem in her store for $10. She also offers a Ranch Wife poem as well! This would make a great Mother's Day Gift! How fun would it be to shop for the perfect frame?